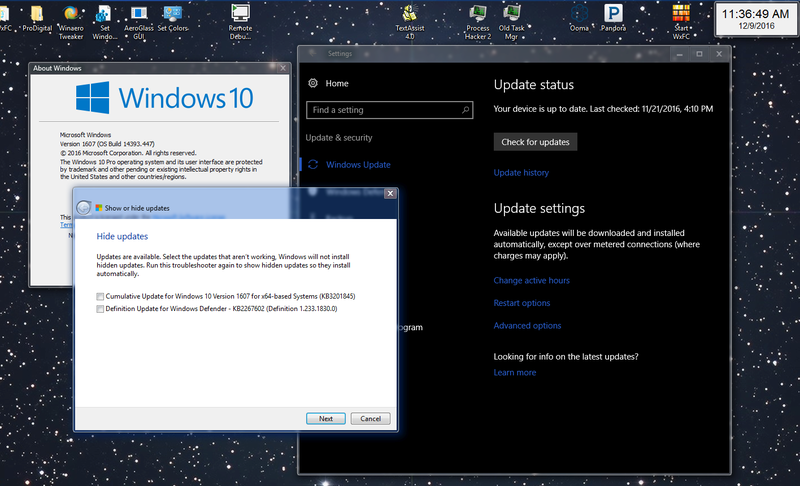 It isn’t on the Windows 10 update site just yet (5 am Pacific time), but I’m seeing it on one of my machines. The KB article is up. Nothing particularly remarkable, but 1607 cumulative updates at this point shouldn’t be. I’ll give it a ride and report on what’s happening in InfoWorld. The Reddit thread is up. Expect /u/johnwinkmsft and /u/jenmsft to appear after they wake up. The timing’s odd – we’re getting a cumulative update for Win10 on the Friday before Patch Tuesday. But this one’s been baking for a long time. It’s been in the Insider Preview Release ring since Nov. 30 (see Bogdan Poppa’s announcement on Softpedia). This topic contains 27 replies, has 3 voices, and was last updated by Keith Brooks 2 years, 2 months ago. It repeatedly fails to install on my pc. Do you get the “rolling back” notification? Head over to https://www.reddit.com/r/Windows10/comments/5hdalv/cumulative_update_for_windows_10_au_and_windows/ and bellyache to John Wink or Jen MSFT. They’re very interested in solving this particular problem! I saw KB320185 show up on my PC this morning, and have got Wushowhide on the case hiding it until Defcon changes. I’m not on any preview group and I’m curious as to why this is being offered now. Should it be installed, or should I continue to let it percolate? If you’re talking about 3201845, wait a few hours. It’s looking good so far. I’ll get a post up on InfoWorld. There seems to be a problem with DHCP after installing this update. We had some support incidents from customers with unmanaged clients. Power cycling the router (if DHCP server) and rebooting Windows send to fix the problem – at least temporarily. Since we have mainly managed clients with 1511 we can’t say how much end users are affected. Check this out in the The Register at 19:52 UK time. I’m looking at it right now. Definitely wasn’t caused by 3201845 – but it wasn’t fixed by 3201845, either. I’m seeing zillions of reports of problems with DHCP – but most of them started two or three days ago. If you remove 3201845, does it fix the problem? It’s up now, but perhaps shouldn’t be. One of our technicians just tried it on an Anniversary Update box and it hung at 0%. After rebooting, he downloaded it from the Catalog and it installed, but WU still tries to download and install it. Weird. I don’t think I’ve ever heard of that combination! It is weird. It seems to install normally from Windows Update if it hasn’t failed before. 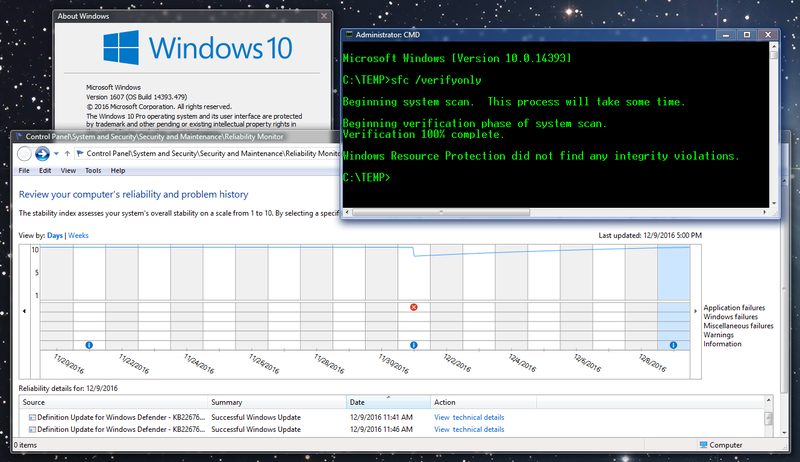 If it failed from WSUS for example, it has problems downloading and repairing itself from Windows Update. In that case, only a manual download and install would fix it. I am wondering if this has anything to do with the express type of packages vs full or it is just too hard for Microsoft to handle the big rollups and get it right the first time. There was the reboot requested after the cumulative update and Defender definitions went in, then it sat for a while with the spinning wheel, then rebooted again to the desktop. For the first time in a long time (maybe ever) I a regular Win 10 update rebooted the machine twice. I don’t think I’ve seen that except way back during the major release in-place upgrades. In any case, after the dust settled after the second boot, all seems well. I haven’t seen any problems in the relatively short time so far. This is a desktop system not on wifi, so I can’t speak to that. But it has no problem with wired DHCP. Just looked at the support site again. Latest is Nov 8, not Dec 9th. Yep. I don’t know what’s happening. Only did the one VM. Guess I’ll hold off on the other two. See email. Maybe it wasn’t supposed to be released till Tues and somebody goofed. This is one of the worst behaving update installers which I have seen. With enough patience, eventually it is all sorted, but it does so much activity on the disk, it looks like reinstalling the operating system all over again. WSUS communication (apparently it is the WU client which is broken for WSUS) continues to be broken. Interrupting WSUS partial downloads create even more headaches. The best way to install seems to be directly from Windows Update and not manually downloading from the catalog, although that procedure should work too. Please do not jump in and install yet if you don’t know what you are doing or in what you are getting involved. Interesting conjecture. I see it still isn’t listed on the Win10 updates page. I had a very long wait for it to update – download went fine, but updating took maybe 20 minutes. Wonder what happened???? And it still isn’t listed on the Win10 Update History page. The size for 64-bit is almost 1 GB. Date of files: 17 November, i.e. 3 weeks ago, enough time for Microsoft to do basic testing. As of this morning – still not on the Win10 history page. Maybe it will show up on patch Tues.
Could be… but KB 3201845 is a non-security patch, and we’ll undoubtedly see lots of security fixes on Tuesday. Woody, do you think that there will be additional patches for Windows 10 on Tuesday?! Absolutely. We haven’t seen the security patches yet. Big question in my mind is if MS will fully roll out KB 3201845 on Sunday/Monday, or if they’ll put it in the security patch on Tuesday. Either way it’s a gawd-awful mess. I experienced a variation of what your technician experienced by trying to install from WSUS and installing manually after interrupting the WSUS never finishing download.